World collection of used & mint stamps, including China, PRC, Bargain! Dealers mix lot of diff. items including Israel early covers, United States stamps, few errors of Palestine stamps on covers and Israel stamps with errors, also some central Africa imperf delux sheets and stamps and other many interesting items. Worldwide lot of very early covers and pre-philatelic including Netherlands, Greece and Belgium. Worldwide collection of stamps in 22 albums incl. China PRC. Israel and worldwide stamp collection incl. 3 picture albums (not completed) with Israel tabs, souvenir leaves (also limited issues), booklets, used stamps in packages etc', bargain! World collection of stamps in 9 albums, incl. Turkey, Iran, Norway, Portugal, Cyprus, Greece, also with many better, Italy with many better. World collection of 16 albums, containing stamps, covers and few catalogues, VF. Worldwide collection of stamps and covers in 14 albums. PEDI collection of 6 covers, including 10 w. number as # 28, one registered cover # 474 with service Suspended and other cachets, one unregistered with arrival pmk # 19687 and others. United Nations collection of FDC, first day covers in 7 albums. United Nations collection of mint stamps and sheets in 4 albums, high catalogue value! Collection of errors from worldwide including imperfs, ovpt errors, missing ovpt and perforation disorders. Collection of errors from worldwide, including imperfs, color disorders, inverted ovpt and other stamps. World collection in box including Israel FDC covers (5 albums), nice topical stamps. Worldwide collections of stamps with errors. French colonies collection of stamps with errors. Africa, French colonies, collection of Mint & Used stamps and sheets, many imperfs and better items in 2 albums. Africa, Central Africa, Guinea, Tchad, Mint & Used stamps, incl. many delux sheets and imperf. Stamps in two albums. Africa,Central Africa, collection of MNH stamps, many topical: Aviation, Soccer, Animals, Space, 2 albums and one album of covers. France colonies- Somali coast full sheet, inverted center, Rare!!! Central Africa- Mint & Used stamp collection incl. many imperf stamps and Delux sheet in album. French colonies, Martinique, New Caledonia, Madagascar, Morocco, Mint & Used stamp collection in album, very high catalogue value!! Cameroun 1940 Spitfire Reg flight cover. Belgian Congo 1886-1894 collection of Mint stamps, Scott catalogue value $ 1000 +. Belgian Congo collection of Mint and Used stamps with very high catalogue value!! Ghana stamps collection 1957 to 1965, mostly MNH, incl. duplicates. Liberia 1952 Jehudi Ashmun airmail ,25c set of 4 imperf proof blocks of 4 stamps. Sierra Leone collection of full MNH sheets, very high catalogue value!! Egypt collection of Mint & Used stamps in album. Egypt Royal palace, collection of misperf and imperf stamps, great collection of errors, rare!! Egypt collection on 72 early covers and postcards, including better items. Syria and Lebanon collection of errors on stamps. Dubai 1963-1968 collection of Mint & Used stamps, mostly MNH, high catalogue value!! Pakistan Full set from 1947, mixed conditions MNH,MLH, used, Top values stamp in MNH. China 1962 and 1971 3 mint sets of stamps. China, imperial and PRC collection of Mint & Used stamps, high catalogue value!! Japan-Indonesia-Thailand collection of Mint & Used stamps in album. Great Britain and colonies Mint & Used stamp collection in album, high catalogue value!! Great Britain collection of used stamps in album with high catalogue value!! Great Britain 1840-1980 collection of used stamps, very high catalogue value!! Great Britain 1980-1998 collection of FDC, first day covers, in 6 albums. Great Britain collection of mint and used stamps, face of mint over 460 pounds, high catalogue value!! British Colonies 3 OMNIBUS SETS (not complete) UPU 1937, 1946, mostly MNH,MLH. British Colonies collection of Mint and used stamps in 8 albums, High catalogue values!! British Colonies A-G stamp collection, mixed condition. Australia collection of FDC, first day covers 1980-1998 in 7 albums. Australia collection of mint and used stamps in 3 albums including many better items, face value of mint is over $ 650!! 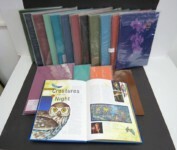 Australia 1981-1998 W/O 1988 collection of 17 yearbooks with stamps. Switzerland and Netherlands collection of Mint and Used stamps in 2 albums. Europe cept' 1960-1987 collection of MNH stamps and sheets, in two albums, including Liechtenstein 1960 n/s, high catalogue value!! Europa cept' 1956-1984 complete collection in 2 Davo albums, high catalogue value!! Netherlands 1867-1974 collection of Mint. Belgium collection of Mint & Used stamps in album, high catalogue value!! Belgium collection of Mint & Used stamps, from 1950-1985, in two Davo albums. Belgium collection of 52 postcards and covers. Belgium 1849-1950 collection of Mint & Used stamps, mixed condition, high catalogue value!! Switzerland collection of mint and used stamps with many better items, face of mint stamps only is over 2200 fr!! Norway 1856-1972 collection of Mint & Used stamps in album. Austria, collection of 77 early postcards and covers. Poland collection of mint and used stamps, including many better stamps and sheets, high catalogue value!! Russia 800 years of Moscow 1947, ministry folder with stamps. Russia 1925 Sc 323, mi 289 A sheet of 25 stamps with offset and extra perforations as to cancel stamps. Russia 3 stamps with errors, missing colors and missperf. France collection of 99 Covers and PC including better items. France collection of Mint & Used stamps in 3 albums, high catalogue value!! France collection of mint and used stamps in 3 albums, including many better stamps, high catalogue value!! French colonies collection of Mint & Used stamps, very high catalogue value!! Cilicia (Cilicie), Turkey, Syria, French colonies great collection of errors, and few regular stamps. French colonies, Cilicie, Liban, Levant, incl. many better stamps, Mint & Used condition, in album, very high catalogue value!! United States, collection of stamps with errors including misperf, imperf and color. United States collection of mint and used stamps in 3 albums. Zambia to Israel 1968 crash cover. France to Saigon 1929 crash cover "Raid Interrompu Par Accident" cachet. Burma 1953 crash cover to England. El-Al crash in Bulgaria, lot of 2 postcards from Netherlands and one registered cover from Germany addressed to Israel. Crash covers, small lot of 7 crash disasters covers, including Netherlands 1934, USA 1929, Palestine 1937 (2 covers) and others. USA collection of 11 FFC, (First Flight Covers) incl. better items. Palestine incoming FFC First flight covers, lot of 5 items including Netherlands, Russia, Finland. collection of 22 FFC, First Flight Covers incl. better items. Palestine 1911 Aus Sarona bei Jaffa, Deutsche Post, folded cover to Berlin Germany, Muentz certification!! Palestine Forerunners- Jewish Colonies: REHOVOT via Rischon L'Zion Par Poste, Autrichienne cachet clear strike blue-black on 20 PARA ovptd Austrian postcard via Jerusalem Oester 29.7.03 & arr pmk Jaffa Oester 30.7.03 on face. postcard bend in middle, still VF. Palestine Jerusalem 1906 registered cover to Germany, very nice franking!! Palestine collection of covers and postcard, German, Russian, French, Ottoman and Austrian post, including many better items 38 pc and 21 covers/letters mixed lot with high retail value!! Palestine 1919 censored registered cover with 2 pi olive (S.G.11) and SAFED OETA skeleton, rare postmark 31.03.19 to LUZERN, certificate by Muentz!! Palestine 1918-1920's covers, incl. ARMY POST OFFICE postmarks, high values, total 9 items (3 postcards) Bargain!! Middle East and Levant WWII CENSOR covers to Palestine, incl. JEWISH BRIGADES, total 14 items. Palestine WWII OAT lot of 10 covers. Lot of 12 covers to Palestine and from Palestine, incl. censor, Jewish brigades etc'. British Detention Camp two covers: a) one stampless sent from Latrun detention camp on 3.7.1944, by Jewish British resistance, Mr Zoybermaer Tehari to Ms. Haya Shwartz Tehori (same family), Jewish British resistance too who was incarcerated at Bethlehem detention camp. Cover arrived at 10.7.44 transit by Jerusalem twice at 7.7.44 and 9.7.44, very rare cover as it was passed between two different detention camps, cover cachet with censor b) second sent from Bethlehem detention camp to Safed by Ms Sara Kalki (unclear outgoing date) transit Jerusalem 10.3.1947, both covers in fine condition opened roughly with creased and tears. Still very rare!! Palestine collection of incoming mail from diff. countries including few registered covers, total of 46 covers. Palestine collection of incoming and outgoing covers and postcards, also Palestine related items, nice mixed lot of 42 items. Palestine APC Anglo-Palestine co bank total of 4 covers with APC perfin stamps, including one registered franked 26m from Tel-Aviv and one from Lebanon to Haifa, one cover to Germany and one to England. Bargain!! Palestine flight covers, collection of 14 flown and first flight covers. Palestine lot of covers and documents with postmarks from small places incl. 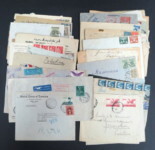 : LYDDA, BET HAKEREM, TEL MOND, KINNERET, MERHAVYA etc., some registered, GOOD LOT with rare postmarks, total 43 items. Lot of Palestine covers & postcards, incl. registered from small places, Total 112 items. Palestine, Jordan, Egypt, Syria stamps collection, mixed condition. Palestine, Jordan collection of 15 covers, including many better items. Jordan West Bank, Palestine collection of 44 covers, many diff. postmarks. Ceylon to Palestine 1932, perfin stamps cover. Overland mail, Baghdad-Haifa collection of 11 covers. 1948 INTERIM lot of 7 M. Ha'am registered covers from different places: a) RISHON LE TSION reg no 0324 commercial local cover, some stains, 10 mm right side shortened. b) RECHOVOT reg no 226, (handmade) addressed to Rishon Le Tsion 9.5.48 mixed franking c) KEFAR SAVA reg no 3176 local cover VF d) HOLON reg no 4137 philatelic with diaspora series 2 stps red Ovpt, VF e) Hertzliya reg no 3910 (philatelic) VF f) PETAH TIKVA reg no 0838 to Haifa VF g) HAIFA reg no 4646 locally addressed, stain, bargain!! 1948 INTERIM lot of 4 philatelic M. Ha'am covers a) Natanya M. Ha'am pmk, franked 3 mils b) Raanana M. Ha'am pmk, franked 3 mils little stain c) Givat Brenner, mandate pmk 30 AP48, franked 2 mil, letter 5 stps of Doar Ivri added with 30.12.1948 kongress 10 trilingual pmk, stain d) Holon, mandate pmk 23 MY 48, franked 4 mils (Bale # 5,9) VF. 1948 INTERIM lot of 3 philatelic Haifa un addressed & colors: a) 60 mils franking (Bale #23,31) M. Ha'am pmk, mandate pmk 13 MY 48 HA triangular pmk, VF b) 100 mils franking (Bale # 28) M. Ha'am pmk, Mandate pmk 12 MY 48 HA triangular pmk VF c) 15 different mandate pictorial stps total 254 mils, M. Ha'am pmk, mandate pmk 12 MY 48, HA triangular pmk stained cover. 1948 INTERIM lot of 6 different better Tel-Aviv registered covers: a) T.A. reg' no 2737 (H.P.O Head post office) locally addressed, properly franked 25 mils cancelled with violet M. Ha'am, pmk front & backside few spots o/w VF b) Tel-Aviv 1 reg' no 0291 (Allenby rd. B.O), local, franked 26 mils cancelled with black M. Ha'am pnk front & back 6 MY 1948 cachet, stained cover c) T.A 2 reg' no 9228 (APC bank) window commer. Cover locally addressed properly franked 25 mils cancelled with black M. Ha'am pmk front & back incl. Marin E co Insurance Pool circle cachet, certificate by Muentz VF & very rare d) Tel-Aviv 5 reg no 1140 (Tel Nordau B.O) locally addressed properly franked 25 mils mixed franking of M. Ha'am stps & mandate pictorial 3 stps cancelled with black M. Ha'am pmks front & back VF e) Same as former but express reg' no 1238 locally addressed franked 200 mils mandate arr pmk 5 MY 48 cancelled with black M. Ha'am pmk back & front stained cover f) Tel-Aviv 13 reg no 3068 (Herzl st B.O)commercial cover locally addressed, franked 100 mils, cancelled with black M. Ha'am pmk back & front, VF & rare registered label as due to nearby franking areas in May 1948 only 200 registered covers were posted see The postal History of the Transition Period in Israel vol I p. 390 nice combination of T.A. registered labels. Interim 1948 Minhelet Haam 11 covers incl: Registered Holon & Koffer Hayishuv mixed Franking, nice lot. 1948 INTERIM lot of 7 philatelic reg. (made by Shneor)of different places incl: Binyamina (no 3771), Holon (no 4092), Nes Tsiona (no 3167), Pardess Hanna (no 1045), Ramat Hasharon (no 0557), Herzliya (no 3886), Beni Braq (no 3176), VF & bargain!! Mandate stamp collection 2.5 1948 INTERIM lot of 6 covers incl a) T-A M. Ha'am cover with Negev pipeline 10 m. red ovpt no value (bale # 33c) b) T.A M. Ha'am cover with Jewish State 5 m violet ovpt no value (Bale 29c) c) T-A M. Ha'am cover with Negev pipeline 10 m. violet ovpt perforation in mis perf & double perf (unlisted Bale) d) 3 covers with double "Doar" ovpt on stp incl Kfar Semaryahu M Ha'am pmk on phil. Cover signed by Muentz Benei Braq M. Ha'am and T.A M. Ha'am. Total 6 items same cover with tear & stains. 1948 INTERIM collection of 32 different post offices black M. Ha'am pmks on un-addressed philatelic covers incl: Sde Nachum, Tel Mond, Tiberias, Yavnee, Naan, Mishmar Haemek, Mizra, Migdal, Meir Shefaya, Meshek Ayelet Hashachar, Maoz Hayim, Kfar Vitkin, Kfar Yedidya, Kfar Yehezkel, Kfar Yehoshua, Atlit, Maabarot, Kfar Sirkin, Kfar Tabor, Kfar Ata, Kfar Baruch, Gedera, Zikhron Yaacov, Metula, Kfar Shemaryahu, Kinneret, Binyamina, Raanana, Afikim, Ramat Gan, Sdeh Yaakov,Tel-Aviv, nice combination of rare pmks VF& Bargain!! 1948 INTERIM, lot of 5 covers w. Kofer Hayishuv: a) ROSH PINA K.H. stp 10 mils (Bale # 133) addressed to Maale Hachamisha, M. Ha'am pmk, stained cover b) PETAH TIKVA local philatelic cover w. mixed franking of 25 mils K. Hayishuv 5 mil stp (Bale # 132), 20 mils mandate stps Petah Tikva M. Ha'am pmk VF c) Tel Aviv local commer. Cover w. Kofer Hayishuv 2 stps of 5 mils (Bale # 132) clear mandate pmk 22 AP 48 nice & rare, center fold stain in front side d) Tel-Aviv local cover w. K. Hayishuv 10 mil stp (Bale # 133), mandate pmk 14 MT 48 stained cover, still very nice e) Tel-Aviv local cover w. Kofer Hayishuv 2 stps of 5 mils (Bale # 132) mandate pmk 30 MR 48, one stp stained, VF. Palestine, Israel-Interim (1948) small collection of Mint & Used stamps in album incl. better stamps. 1948 INTERIM, lot of 6 better covers with mandate different pmks: a) KARKUR reg' no 4026, addressed to Zichron Yaacov, 16 MY 48 properly franked 25 mils, Doar Ivri stps, arr mandate pmk 19 MY 48, VF & rare, commercial cover b) Sdeh Nahum commer. Cover un addressed, franked 12 mils mandate pmk 16 MY 48, VF c) MAABAROT philatelic cover, addressed to Haifa, franked 10 mils D. Ivri stps with mandate pmk 16 MY 48 & M. Ha'am Maabarot pmk, stained cover d) Tel Aviv local cover franked 10 mils, pmk 4 MY 48, VF e) HERZLIYA local cover mixed franking of 20 mils (10 mils M. Ha'am stps & 10 mils D. Ivri stp), pmk 17 MY 48 light stain & adhesive tape in backside o/w VF. 1948 INTERIM collection of 25 different Post Offices pmks on addressed inland covers, most commercial, incl: Beer Tuvia, Zikhron Yaacov, Kfar Sava, Qiryat Motzkin, Benei-Braq, Meshek Ein Harod, Meshek Yagur, Ramat Hasharon, Pardess Hanna, Petah Tikva, Haifa Ahuzat Samuel, Haifa, Tel-Aviv X 2, Holon, Givat Brenner, Herzliya, Hadera, Rehovot, Ashdot Yaacov, Nathania, Herzliya, Beit Alfa, Bat Yam, Tiberias, Givat Hayim, nice combinations incl rare pmks most VF & Bargain. 1948 INTERIM- NESHER VAJUR reg. cov # 1239 to Kefar Ata franked properly 25 mils M. Ha'am stps (Bale # 2,6) tied by properly black M. Ha'am 2 pmks front & back 5 May 1948, arr. Mandate pmk 9 My 48 VF. 1948 INTERIM - HADERA commerical reg no 2529 cover addressed to Zikhron Yaacov, franked 26 mils Mandate stps 1 mil extra franking, cancelled by Minhelet Ha'am psk in front side, dated 7 May 1948, repeated twice on back plus M. Ha'am Zikhron Yaacov arr pmk, VF. 1948 INTERIM - TEL MOND registered, no 0427 Express cover, posted to Tel-Aviv, franked 65 mils with full set of Jewish State Minhelet Ha'am stamp 5,10,50 mils, cancelled by Tel Mond, clear 3 pmks, arr Tel-Aviv Mandate 5 MY 48, (about 50 reg covers are known),numbered 0394-0442 see similar cover at the The postal History of the Transition Period in Israel I vol I, p. 397 Bale 700$, some stains on cover, still VF & rare!! 1948 INTERIM NATHANIA reg. cover no 2210, posted local at 3 May 1948, franked properly with M. Ha'am 25 mils stps ( Bale # 7,7c, 32) tied by Nathania 2 violet pmks front & back, VF. Israel Haifa united states, 25.5.1948 flight cover departure from Haifa, reg. 0741, 85 m, Doar Ivri stamps with Tabs 3,20,50 m and plate block of 3 m, arrival to New York at 12.6.48, and forwarded to destination at 14.6.1948, VF & rare!! 1948 INTERIM QIRYAT MOTZKIN reg no 71 frank 23 mils (one stamp of 2 mils fallen) Minhelet Ha'am stamps (Bale 1,23,29,32), on Telegram small cover, cancelled by Qiryat Mitzkin pmk front & backside (about 250 reg covers are known) numbered 0005-0252, tied by arrival Mandate pmk 11 MY 48, trace of adhesive tape, stain, still VF and unused item, as it was sent on telegram cover. 1948 INTERIM G'VAT genuine correspondence cover, Kibbutz Gevat to Kibbutz Hazorea, franked with M. Ha'am 10 mils stp (Bale #21) tied by black M. Ha'am pmk Gevat, date 11.5.48 alongside inserted by hank VF & scarce item as only 4 reg covers were sent during Interim period (see The postal History of the Transition Period in Israel vol I, p. 196) signed in pencil on backside by Y.Tsachor as well as certificate by him. VF & rare!! Israel 1948 courier cover from Youth Aliya Camp Karkur near Hadera, franked with 10 m JNF stamp w/o ovpt, tied by Bat-Yam mandate pmk 25.4.48, addressed to Tel-Aviv, stained on back but nice cover. 1948 INTERIM TIRAT ZVI, genuine brown cover with Tel-Aviv address, franked with M. Ha'am pair of 5 mils Weizmann stps (bale #11), tied by clear and complete strike of M. Ha'am pmk TIRAT ZVI, cover has minimal creased o/w VF & extremely rare item as very few registered letters are known that were sent during this period. Please see: The postal History of the Transition Period in Israel 1948 p. 401 estimated value $ 1000. VF & extremely rare!! 1948 INTERIM between two different postal authorities: RAANANA registered cover no 2555 (third not recorded), franked 27 mils Mandate stps, tied by Raanana M. Ha'am pmk, addressed to Herzliya post with Mandate arrival pmk, 4 MY 48 & M. Ha'am Herzliya pmk. Please note that Raanana addressed M. Ha'am pmk is different incl dated 2 MY cover stained, very rare. Similar item sold a few years ago for $720 VF & rare!! 1948 INTERIM- 2 taxi covers Tel-Aviv to Haifa: a) Tael commercial cover incl. & cachet tying Kofer Hayishuv 5 mils stamps partly label backside was creased, cover with trace of adhesive tape still F & Rare b) Taxi Aviv, on front 5 mil Kofer Hayishuv label tied by taxi Aviv cachet on front VF. 1948 INTERIM MERHAVIA genuine correspondence cover, Kibbutz Merhavia to Kibbutz Hazorea, franked with M. Ha'am 40 mils stp (Bale # 7), tied by black M. Ha'am pmk Merhavia, slight central vertical fold, VF& scarce item as no reg letters known from this period. Estimated value $ 4000 (please see The postal History of the Transition Period in Israel p. 163), signed in pencil on backside by Y. Tsachor with certificate by him. VF & extremely rare!! 1948 INTERIM RECHOVOTH 5 mils Kofer Hayishuv Bank tax & 5 mils Local Defence Tax (unrecorded by Wallerstein catalogue) tied to local commercial bank cover by 2 M. Ha'am pmks Rechovoth with 2 strikes of Mandate pmks dated 2 MY 48 , commercial cover certificate by Muentz. VF & rare!! Israel besieged Ben-Shemen near Lydda, cover to Tel-Aviv sent by soldier to civil address with army pmk "Base A" 22.6.48, flown cover by Haggana airplane, central vertical fold and few wrinkles, good condition signed at bottom on reverse and cert by Tsachor. VF & rare!! 1948 INTERIM - BAT YAM reg cov # 0262 to Bat Yam franked properly 25 mils M. Ha'am stps (Bale #12,29), tied by black M. Ha'am 2 pmk front & back, VF Bale $ 350. 1948 INTERIM MISHMAR HAEMEK philatelic cover, addressed to Tel-Aviv, franked with 38 mils Doar Ivri stps (Bale # 1,2,3,5), tied by black 2 M. Ha'am pmk, Mishmar Haemek pmk, cancelled by Mishmar Haemek, 2 Mandate pmk 15 MY48, one day before the official Mishmar Haemek Doar Ivri stps. Use of M. Ha'am pmk is considered quite rare as very few registered covers were sent during this period, VF. 1948 INTERIM- RAANANA regular cover addressed to Herzliya, franked with only 5 mils M. Ha'am stp (Bale # 29), 10 mils low tax was paid upon arrival using interim stp (Bale #16). This cover might be philatelic, as the "to pay" handmade cachet at top left side was cancelled by pencil letter, cover cancelled with black M. Ha'am pmks front side and mandate pmk 2 MY 48 VF! 1948 INTERIM YOKNEAM express genuine commercial cover addressed to Haifa, franked properly with Mandate 50 mils stp, tied by Yokneam black M. Ha'am pmk., few toning on stamp. VF & very scarce item as only 5 reg. letters sent in this period are known, estimated $1000 (see The postal History of the Transition Period in Israel vol I p. 407) VF & extremely rare!! 1948 INTERIM 17.5.1948 Haifa trilingual pmk, VF - RAMATAIM reg cover no 4312, posted to Tel-Aviv, franked properly 25 mils M. Ha'am stps (Bale # 1,5,16,24,32), tied by black M. Ha'am pmks front & back, 5 MY 48 arr. Mandate pmk VF. 1948 INTERIM - QIRYAT AMAL reg. no 14 on handmade label due to patriotic reasons properly frank 25 mils Minhelet Ha'am stamps (Bale 1,5,10,29,30) cancelled by Qiryat Amal pmk front & backside, (about 35 reg cover are known) numbered 1-37, see sister cover at The postal History of the Transition Period in Israel vol I p. 333 (similar cover sold a few years ago for $1200) some stains, still VF & extremely rare!! 1948 INTERIM-EVEN YEHUDA reg. cover no 0636, franked properly 25 mils M. Ha'am stps (Bale # 5, # 30), cancelled front & back side by Even Yehuda M. Ha'am pmk. Enclosed the cover interim postal R-receipt 14.5.48, cover has stain around the stps and label, still fine & very scarce as only 20 reg covers are known numbered 0618-0637 (see The postal History of the Transition Period in Israel vol I, p. 162) estimated value $1500. VF & extremely rare!! 1948 INTERIM - KEFAR SHEMARYAHU reg. # 0746 properly franked 25 mils M. Ha'am stps tied by black M. Ha'am pms repeated on back, addr. To T.A transit Herzliya M. Ha'am pms & Mandate 12 My 48, VF & rare!! 1948 INTERIM KEFAR YONA reg no 0446, cover addressed to Natanya properly franked 25 m. (Bale #29+Diaspora # 42,43) tied by 2 M. Ha'am pmks in black, repeated on back, Kefar Yona 11 MY 48 very clear Mandate pmk on front side, handmade name in regist. Label Nathania M. Ha'am pmk in violet as arrived. The original r-trace 10.5.1948 with K.Y. pmk (about 20 reg.covers were sent) numbered 0443-0464, light scattered spots around the reg label o/w VF& rare (see The postal History of the Transition Period in Israel vol I p. 268 ) similar item sold a few years ago for $ 870. VF & extremely rare!! Israel Besieged Negev army post, lot of 7 flown covers, including better items. 1948 INTERIM- ALONIM reg no 0508 locality by handmade propely frank 25 mils Minhelet Ha'am 5 stamps (Bale 6), tied by black M. Ha'am 3 pmks in front, repeated on back in violet mailed to Dayan family at Nahalal from Dori family at Alonim (about 10 registered covers are known), numbered 0500-0510!) see The postal History of the Transition Period in Israel vol I p. 170 (similar item sold a few years ago for $1450), VF & extremely rare!! 1948 INTERIM YAVNEEL, genuine commercial cover, addressed to Haifa, franked with M. Ha'am 10 mils stp (Bale # 23), tied by Yavneel black M. Ha'am pmk, with gap in the Hebrew inscription due to erased letter "Yod" light vertical central fold and toning, V.F & scarce item, signed in pencil on backside by Y. Tsachor with certificate by him. VF & rare!! Jerusalem 4.jun 48 reg cover to Tel-Aviv arrival at 21.6.48 2nd convoy registered label Jerusalem # 0695! Jerusalem 1948 Hagana cover, registered # 159 and urgent written by hand, bluish dispatch pmk m-k/ J-m, date is not clear, 2.. May 1948, cover with tropical stains on both sides,certification by Muentz. VF & rare!! Jerusalem 1948 reg cover # 3045, Jerusalem 1, large Mea Shearim pmk on mandate stamps, correct franking for local registered letter, early philatelic cover from 12.5.1948. VF & extremely rare!! Jerusalem 1948 3 periods cover. Jerus. 6 reg cover # 4199 to Dafna, 40 m stp and carries no value tied by 16.5.48 pmk, sent by 2nd convoy to Tel-Aviv 21.6.48, then transit to Tiberias at 23.6.48, and to Rosh Pina the same day sent pmk, center fold and tropical stains on both sides. Jerusalem 1948 printed matter cover 7.6.48 from Magen David Adom, bearing 5 m local stamp 3rd issue (Gimel) tied by rosette pmk, folded at middle and slightly stained. Jerusalem 1948 collection of 22 covers showing different pmk of Jerusalem, including 9 registered covers and courier mail. Also, one French consular on blank cover and other many better items. Jerusalem Hagana 4.8.1948 cover bearing 2 MK-JM pmks, torn at back. Jerusalem 1948, reg cover # 0174 from Mahne Yehuda 11.7.48, 25 m Doar Ivri stamps tiedby Detective pmk arrival on back Bat Yam 14.7.1948 stained and folded cover. Jerusalem to Tel-Aviv, 4.5.1948, reg cover Jerusalem 1 # 3363, 2nd convoy 21.6.1948 to Tel-Aviv. Jerusalem 2 covers, both to P. Rosenblit (minister Pinchas Rosen), one from 21.6.48 carrying non local stamp tied by oval pmk and one carrying 10 m local stamp tied by rosette pmk (roughly opened). Jerusalem 1948 4.7.48 1st day of Israeli pmk in Jerusalem cover. Jerusalem 1948 cover franked by 10 m, 25 m 2nd local issue, 5 m 3rd issue (Gimel) tied to cover by 3 Israeli 11.8.48 pmk Jerus. Taxed at Rechovot 12.8.48 1st postage due 20 m certification by Muentz. VF & rare!! Jerusalem Israel 1948 Interim Jerusalem 5 m 3rd local issue "Gimel" half sheet of 10 MNH stamps, light marks of hinge On margins and light toning on gum. VF & rare!! 1948 JERUSALEM "Yeshivat Hovevei Tora" bilingual Eng&Heb stationary cover, locally addressed, properly franked 10 mils 2nd local issue tied by Rosette pmk & dated 14 May 1948, "Yeshivat Hovevei Tora" was an undercover name of the "Irgun" revisionist organization in Jerusalem, used to invite members to avoid detection by the British, VF & rare!! Jerusalem 1948 reg cover from Anglo Palestine bank (Jerusalem) to Rishon Le Zion, carried by 1st convoy to Tel-Aviv and the same day to Rishon arrival pmk at 18.6.48. Jerusalem 1948 military mail town commander 4.5.48 cover. VF & rare!! Jerusalem 22.6.48 egg shaped pmk franked by 5 m printed matter, commercial cover from Discount bank. Jerusalem 1948, flown cover out of besieged city by military plane forwarded by army post KBA 217 with 10m Doar Ivri stamp tied by Tel-Aviv 30.5.48 pmk, at appr left clearance password "Maria" certification by Muentz. VF & rare!! Jerusalem courier cover bearing 10 m 2nd local stamp tied by Tel-Aviv 23.6.48 pmk cover forwarded to Haifa untaxed, cover is roughly opened and uncomplete at left, signed and cert by Muentz. Israel 1948 INTERIM JERUSALEM 3rd local issue brown "Gimel", half sheet of 10 MNH stamps, light crease on margins. VF & rare!! Israel Jerusalem 1948 cover franked with Jerusalem 10 m 1st local issue tied by 27.6.48 Tel-Aviv pmk, unaccepted as postage, taxed by 20 m postage due at 30.6.48 VF & rare!! Jerusalem 1948 French consular 20m on 6Fr. Cover to Paris France 2 oc 48, Postes Francaise Jerusalem, cert by Muentz, type 2 ovpt at left. VF & rare!! Jerusalem Ottoman bank cover to Tel-Aviv with mixed franking of 3 mandate 2m pictorial and one 5 m of the 2nd local issue tied by 2 M. Ha'am pmk, Jerusalem, line dater 12 May 1948, certification by Muentz. VF & extremely rare!! Jerusalem Hagana 1948, flown cover from Jerusalem to Tel-Aviv 12.7.48 military office 5 and KBA 211/a on front of cover. Jerusalem 1948 French consular 6Fr. Ovpt with 20 m tied by 2 pmk Jerusalem postes francaises 3 jul 48, arrival pmk on back Paris tri no.1 depart at 13.7.48, cover sent from J perrot consulat general de France Jerusalem to P Perrot at France. VF & extremely rare!! Jerusalem 1948 courier cover to Tel-Aviv pair of 5m 2nd local issue tied by Tel-Aviv 24.6.48 pmk. Jerusalem 1948 French consular 20m on 6Fr. Stamp airmail cover to France with arrival pmk paris tri no.1 depart at 19.7.48 on front 2 vt pmk Jerusalem/ Postes Francaise, 13 JUL 48. VF & extremely rare!! Israel 1948 INTERIM JERUSALEM 3rd local issue brown "Gimel" full sheet of 20 MNH stamps # 0848, light gum faults on margins, bale cr $ 3250. VF & extremely rare!! Jerusalem courier cover baring 10 m of the Jerusalem 2nd local issue tied by Tel-Aviv Israeli pmk 1.7.1948, nice cover with centerfold and slightly stained, certificate by Muentz. Jerusalem 10 mils OTSAR Ha"AM revenue stamp tied to cover addressed to Herzliya, by Israeli trilingual postmark Jerusalem 1. 21.7.1948 the item presumably went through the mail as other recorded examples of this franking were accepted in Tel-Aviv. Apart from a few trains in very good condition. VERY RARE as OTSAR Ha"AM revenues are very seldom offered as accepted for regular postage. Certificate by Y. Tsachor, as well as signed in pencil on reverse. Only a few recorded. VF & extremely rare!! Jerusalem 1948 The OLD CITY 2nd "WALL" postmark, a cover brought from the old city Jewish quarter in May 1948, and then delivered by the Minhelet Ha'am post tying with 2X5 m 2nd Issue, at first it was cancelled in the Jewish quarter with the Abulafia second wall postmark, then it was brought to the new city, cancelled at the sorting office with the Rosette postmark as transit, VF & Rarity. Please see similar cover at Jerusalem & Safed Postal Services p. 210. VF & extremely rare!! Jerusalem, 1948 siege cover, stampless from the first president of the supreme court to the dept of Justice, provisional government of Israel. This rare Jerusalem siege cover flown by Army Plane to Tel-Aviv with framed Hebrew cachet "Commander of Brigade Air Service", on reverse and dateless arrival pmk APO 3 postmark a little smudged, cover torn at bottom and slightly stained. Certificate by Muentz VF & Rarity, please see similar cover at Jlm & Safed Posted Sources p. 148. VF & extremely rare!! Jerusalem, 1948 siege cover, stampless from the besieged Mount Scopus in French "Via the Red Cross", with RED CROSS cachet and trilingual Israeli postmark Jerusalem1. to the main post office in the jewish part of Jerusalem arrival postmark 14.9.1948, Vertically creased in center with small tears on top, traces of brown glue & two rubbed spots at lower left. Certificate by Muentz, similar item sold a few years ago for $ 7440. VF & extremely rare!! Safed collection of 7 philatelic covers showing different dates on covers, 6-16 May. Safed- unadopted Essay cover with stp imprint in black VF. Safed cover, 10 m stamp with left margin tied by Safed local pmk to cover addressed to Tel-Aviv without arrival, folded at the middle.